Our workplace went out on strike Friday, June 1st 2018. It was the second time in two weeks. Earlier that morning CWA union stewards and mobilizers gathered with (working) union officers in the cafeteria break room. We were anxious to strike again after months of daily workplace actions designed to show our determination to resist the concessions being demanded by the Company in contract negotiations with the Union. At 12 Noon workers on four separate call center floors stood up and announced we were going on an Unfair Labor Practice (ULP) strike for the rest of the day. The vast majority of workers filed out, including for the first time AT&T Technicians and workers in the Teleconference department. A loud and energetic picket line replaced the drudgery of answering calls and emails from AT&T’s business customers. We were not the only place to strike. AT&T workers in Detroit, Milwaukee, St. Louis, Dayton OH, Muncie IN, Syracuse NY, and several other locations all went out. A week later members of the CWA struck for the day in Georgia. All of these locals are under 2 expired contracts between AT&T and the CWA – one for the old “Legacy T” AT&T (long-distance), and one for the Midwest – the old “Ameritech” area. These strikes have been for one or two days only - around Local grievances and ULP’s and not around the overall terms of a contract. The short strikes allow the Local unions to test their organization and morale without having their members face huge holes in their paychecks. In some areas the strikes are organized exclusively by the Local leadership, in others there is strong pressure from the ranks – in my workplace and probably in most of the other strikes, there was some combination of both. The International and District union leaders have taken a “Don’t Ask, Don’t Tell” approach to the strikes. For legal reasons the bureaucracy does not want responsibility for Local grievance strikes, but they are not trying to stop them either. 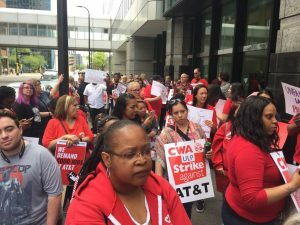 Despite the blackout in the national and Union media, AT&T workers have been passing news and links to local stories about the strikes around. This ensures widespread knowledge of the strikes popping off and creating momentum around the awareness that we are part of something bigger than our own building or town. The eagerness of workers to go out on strike, and the willingness of the Unions to organize them or at least let them happen shows we are in a new period for the labor movement – that some of the fear and conservatism is starting to fall away. Looking at the Teachers’ strikes this past spring, and the possible UPS Strike this summer lay the basis for a new kind of movement. The widespread one- or two- day CWA grievance strikes lay the basis for a bigger all-out confrontation with AT&T – one of the most powerful corporations in the world. AT&T made over $29 billion in profits last year, bought DirectTV for $67 billion in 2015 and is now paying more than $85 billion to buy Time-Warner (and apparently another $600K in an attempt to bribe the Trump administration). But capitalism isn’t sentimental. The AT&T bosses want to squeeze us for more: shifting more of the burden of healthcare costs on its employees; reinforce the separate “tiers” of workers that may work next to each other, but have drastically different benefits; and erase the commitment to solid numbers of good paying jobs under each contract. -	Defeat the “divide & conquer” strategy of the bosses by spreading the struggle across the other 10 (!) CWA-AT&T contracts and their different expiration dates. -	Ask for and build sympathy strikes among workers in other telecom companies like Verizon and CenturyLink and into other sectors of the economy. -	Solidarity NOT competition with call center and telecom workers in other countries. Fight to extend living wages across the borders to all AT&T workers and sub-contractors. -	Take a page from the legendary revolutionary Industrial Workers of the World (I.W.W.) union and refuse to align with either of the bosses political parties – and instead build independent working-class movements and institutions of resistance and mutual aid.